Rent apartments in St Julian's, Malta. Book affordable holiday rentals that are near a beach. This one of a kind property is situated exactly on the St Julians Sea-Front offering fantastic ever-changing views of the bay. This 3 bedroom apartment is located in St Julian's and sleeps 8 people. It has WiFi, parking nearby and air conditioning. This 2 bedroom apartment is located in St Julian's and sleeps 4 people. It has WiFi, garage and parking nearby. This 2 bedroom apartment is located in St Julian's and sleeps 4 people. It has WiFi, parking nearby and air conditioning. This 2 bedroom apartment is located in St Julian's and sleeps 6 people. It has WiFi, parking nearby and air conditioning. This 3 bedroom apartment is located in St Julian's and sleeps 6 people. It has WiFi, garage and parking nearby. This 2 bedroom apartment is located in St Julian's and sleeps 3 people. It has WiFi, parking nearby and air conditioning. 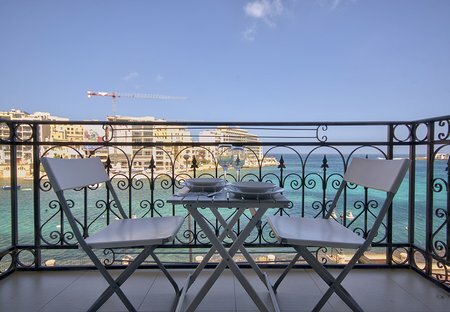 This luxurious seafront apartment measures 180 sqm, and has 2 balconies overlooking the beautiful Spinola Bay, St Julians. 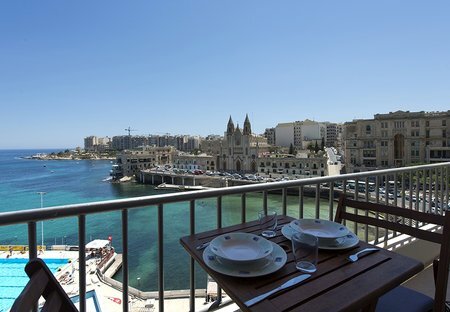 It is few minutes walking to Sliema and to Paceville. This is a lovely one bedroom penthouse, with two large outside terraces, located on the seafront in Spinola Bay, St Julians. This penthouse enjoys breathtaking views of Spinola and Balluta Bay. This lovely penthouse has two large outside sunny terraces and is located in a quiet but central area in St Julian’s. St Julians is one of the largest touristic areas in Malta. This seafront 3 bedroom apartment is located on Spinola Bay, St Julians, and enjoys spectacular views of Spinola and Balluta Bay from its seafront balcony. This lovely and large apartment is located in Spinola Bay, in a quiet but central area in St Julian’s. The seafront is just 200m away from the apartment.